Yoghurt is a fussy little beast. Too cold and it doesn’t process well. Too hot or too long and the cultures you’re trying to encourage die off and you miss their essential role in your recovery. 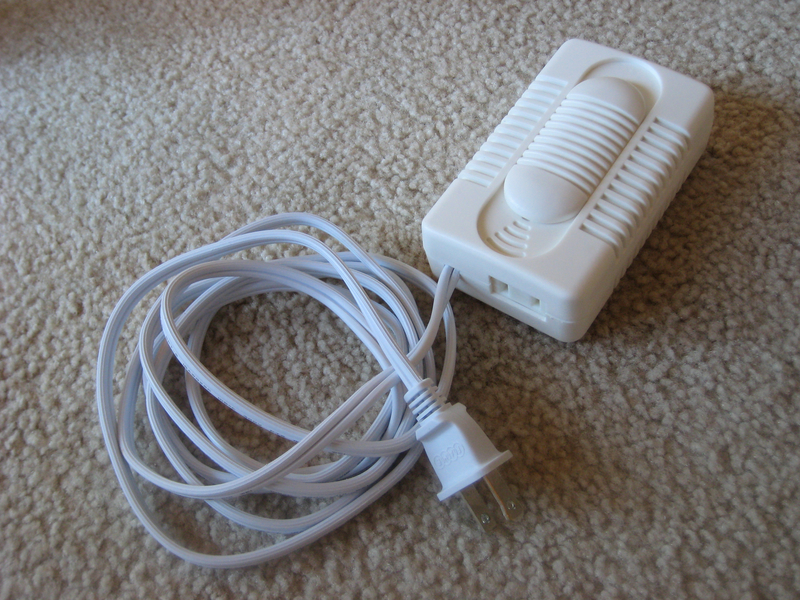 Review this post regarding temperature control before you begin. Consider this page on the BTVC website required reading. I find this to be the most versatile version of yoghurt. It produces a thicker yoghurt than whole milk or reduced fat milk. It can easily be used in place of sour cream. It’s great for making smoothies and using in baking and cooking. Cooking yoghurt, as in chicken khorma, will kill the bacteria so don’t consider cooked yoghurt as a probiotic. 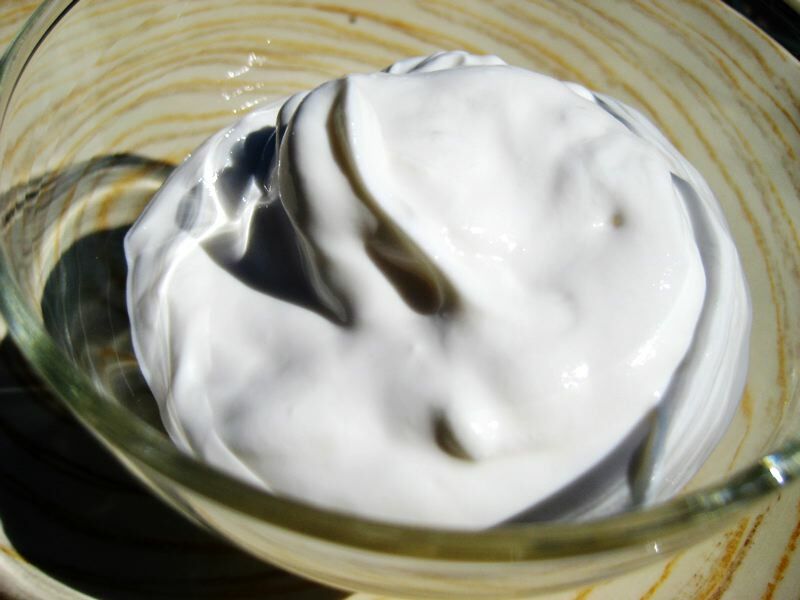 1/2 cup Dannon All Natural Plain Yoghurt. It contains only milk and yoghurt cultures. Carefully read the label as the lower fat yoghurts have illegals. -OR- One packet of Yogourmet freeze dried starter. * Half and half is a mixture of 50% whole milk and 50% cream with a fat content in the 10-18% range. A pan large enough to hold the yoghurt. I use the Yogourmet Multi Yogurt Making System along with a dimming switch. It works great and can make up to a half gallon of yoghurt at a time. They are not difficult to find on the web. This recipe should work with any yoghurt maker, however. Put half and half and vanilla extract into pan over medium heat and affix temperature probe. Stir occasionally at first then more frequently as the temperature approaches 180° F.
Hold at 180°F for three minutes, stirring regularly to avoid skinning and scorching. Thoroughly whisk Dannon yoghurt (or Yogourmet starter) with 1 cup of the cooled half and half. Thoroughly whisk the mixture with the rest of the half and half. Put mixture into yoghurt maker and plug it in. Use a dimmer switch if necessary. Let it process for 24 – 29 hours. No longer though, as longer processing will begin to degrade the bacteria and you will lose the probiotic properties you are aiming for. If you don’t start your processing timer until your yoghurt hits the 100-110 degree range, you’ll be safer sticking closer to the 24 hour mark. Move yoghurt to refrigerator and allow to cool completely, usually overnight or use the cooling note below to speed it up. To cool your yoghurt quickly, you can use the following method. Making sure your sink is clean, place your hot yoghurt pot into the sink. Add cold water to the sink until it completely surrounds your pot and nearly makes it float. You can also add ice or cold packs if you like. Let it sit for a while, stirring occasionally so it does not skin over. Check the temperature and if it is still too high, drain the sink and add new water. Let it sit for a while, stirring occasionally. Repeat steps 4 and 5 as many times as you feel necessary to reach room temperature. Read the post about keeping your yoghurt thick. Great site! I have been on SCD for several years for Crohn’s and am always looking for new ideas. One question about the info in this recipe…why have you said to ferment for 34 hrs? Elaine said that 24hrs was the right amount of time and that anything longer would start to deplete the number of active bacteria in the yogourt. Was that a typo? Thank you for the note. Thirty-four wasn’t a typo, but an error. I’ve been learning more about SCD yoghurt lately and have edited this post to reflect what I’ve learned. One of my original thoughts about yoghurt was that I wanted it to be thick and I thought that the longer it fermented, the thicker it would be. In the early days, I let if ferment for 48 hours! This was far too long and was killing the probiotics I watnted – oops. 1) Use unflavoured gelatin. 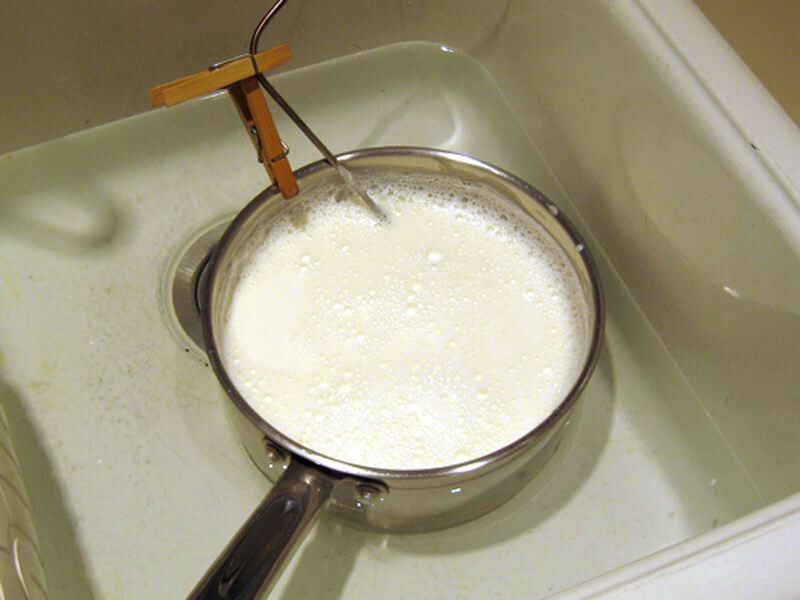 Just dissolve one pack (per litre of milk) into the milk when it has been heated to 80 degrees celsius then once it has cooled down to room temp. add your starter the way you normally would. You will have to do a lot of mixing and probably won’t get all of it to dissolve but once the yogourt has fermented there won’t be any gelatin chunks in it. 2) Make yogourt with whole milk and drip it in cheese cloth until you get a really thick yogourt. Usually takes about 8 hrs to get really thick. I drip it in the fridge but I think you can do it on the counter at room temp. as well. When I first started making yoghurt I was using lower fat milk. Then I switched to whole milk which made for a thicker yoghurt. I’ve finally settled on using half and half (half whole milk and half cream) which makes it as thick as I want. I would love to know what you mean by a dimmer switch. Where did you buy it? I have looked around and they only come fitted with lights?? I am from Australia and would love just to be able to buy a yogurt maker that was appropriate for this diet? HOpe you can give me some ideas!! You can see that it has an electrical outlet that you can plug your yoghurt maker into which in turn is plugged into an wall socket. The big lozenge shaped thing is the dimmer switch – it slides from full on to near off. I purchased it from Lowes, a local home-improvement super store. It was in the lighting section. It seems to be designed for taking a regular lamp that is not dimmable and making it dimmable. There are several options to using a yogurt making device. The Excaliber dehydrator seems to be quite popular due to its ablilty to keep an even temperature and doing double duty for drying fruits, etc. Some use their ovens, others an insulated box with a lightbulb, still others a heating pad or a crock pot. Check around on the internet and youtube for other ideas. Of course the big thing for us SCDers is to make sure the yoghurt doesn’t get too warm. I’ve only used the yoghurt maker so I can’t give you first hand experience with the other methods. Thank you very much for your yogurt tips. I am going to try it. I have tried to make yogurt four times and it has been watery. The last time I tried the yogurtmate starter kit, goat milk and a yogurt maker and it still came out watery. I am going to get some half and half today, meanwhile can I eat this watery yogurt or is it unsafe? I still have it and don’t really want to waste another batch. Assuming that your yoghurt achieved the correct temperature for at least 24 but no more than 34 hours, it should be fine. I have never tried making goat yoghurt so I don’t know what to expect when it is “correct”. The real goat yoghurt experts are on the pecanbread group on yahoo. If you have not already tested your yoghurt maker for temperature, I strongly suggest you look into this. See this post . This recipe for yoghurt comes out awesome. I’m going to be using your blog a lot. Thanks for sharing. That’s great and you’re welcome. Thanks for the great and detailed article on using a dimmer switch for yogurt. In your May 22 post above to Kee, you say yogurt can be cultured for “at least 24 but no more than 34 hours” to be SCD-compliant. Why not more than 34 hours? Oops! Sorry. I just found an answer to my question under step 8. of the yogurt-making directions. I forgot to stop my yogurt last night! which means it fermented for 36 hours! oh dear. do you think i should throw it, or will it be safe to eat, just with less good bacteria? I wouldn’t throw it. It may not have as much active culture as it did at 24 hrs, but I suspect that it still has some. If you notice a big change in how you feel, review what you’ve been eating and see if you think this longer yoghurt is affecting you. And even if it had no active culture, you could still bake or cook with it. Maybe it’s time for some frozen yoghurt? Thanks for all the great info! I made my first batch of SCD yoghurt on Sunday and noticed that the container seemed very warm when I took it out of the Yogourmet. I’ll do the water test you recommended and see what results I get. I wonder if I should be safe and just pitch the yoghurt I just made? Did you notice that you had problems when you ate the yoghurt that had overheated? If you’re unsure then yes, the safest thing to do is not use the yoghurt as it may have lactose in it. There is just no way of knowing without some sort of I’m not aware of. I did not notice problems when my yoghurt was too hot as it was too hot from the beginning. My progress on the diet was very slow – it took me about 3 years for my symptoms to disappear. If I had discovered that my yoghurt was too hot sooner, perhaps I would have lost my symptoms sooner. Just started a batch of yogurt. I have the same yogurt maker that you have (with a dimmer switch) and I have a few questions…. 1. When using the dimmer switch, the light on the yogurt maker is OFF. Is that what yours does? 2. I’m making a full batch. I filled the yogurt maker to the top line (think it’s 12 oz). When I put the inner container in the water rises to the very top. Is that how much water you put in? 3. Why do we cool the yogurt to room temp and not 108 degrees like the booklet says? How long does it take to go from room temp to 108 degrees? Do I start counting the 24 hours now or when it reaches 108? 4. Do you use the thermometer included with the yogurt maker to periodically check the yogurt temp? 5. Looking at your picture it looks like you only eat the top of the yogurt. Does the liquid at the bottom contain any of the probiotics? I’m so sorry if you’ve already answered these questions a million times. I’ve read everything through, but I’m tired, sick, and crabby and possibly in a little bit of a “brain fog”! 1. No. The light goes from light to dark depending on the position of the dimmer switch. 3. a) I suspect that is because if you introduce the culture at too high a temperature, it would kill it. adding it at room temperature gives you a lot of headroom, therefore greater chance of success. b) Depends. I speed it up by placing the pan in a sink of cold water and ice. c) Start counting when you hit 108 degrees. 4. No. Now that I have confidence in my yogourmet and dimmer setup, I do not check the temperature. I suppose I should occasionally to be sure. 5. a) I eat all of the yoghurt, not just the top. I like my yoghurt thick, so I remove it from the canister in such a way to make it easy to drain off the liquid. b) The liquid certainly does contain probiotics – it can be used to start other cultures like sauerkraut, for instance. Thanks for getting back to me so quickly and for answering all of my questions! The yogurt has been in the yogourmet for almost six hours now and is almost getting to 108 degrees. Not sure if that is standard or not…but I’m giving it a shot. Six hours is the point where I hit the range and turn my dimmer down. I just set a timer for six hours when I first plug in my Yogourmet. The most common illegal ingredient is corn syrup, a.k.a. HFCS, or corn sugar. The safest thing to do is make your own. It’s easy to do but takes a lot of waiting. If you just want to pick some up, try “Simply Organic” vanilla extract. I don’t know if anybody has a letter on it, but the ingredients label reads legal. Beware of Penzeys vanilla extract. I really like their spices, but I ordered the vanilla extract once and found that it contained corn syrup. I should have inquired before I ordered as the description on their website didn’t include an ingredients listing. Love this recipe, but I’m wondering if it is okay to freeze. I know it would lose it’s probiotic qualities, but presumably I could still cook with it if it freezes well. I have never frozen it then attempted to use it thawed. I’ve only made frozen treats out of it so I don’t know if it breaks when it thaws. Give it a test with a small amount to see. Freezing the yogurt is not supposed to affect it’s probiotic qualities, but it may, perhaps, dim them a bit. In my reading, the frozen yogurt is supposed to be healing. Looking at the recipe it seems that the Dannon All Natural Plain Yoghurt is safe to eat. So if a recipe calls for yoghurt, Can I use the Dannon All Natural instead of making my own yoghurt? No, commercial yoghurt is not SCD legal. It has not been fermented as long as SCD yoghurt and still contains milk sugars that we are trying to avoid. When used in the making of SCD yoghurt, the long fermenting time consumes sugars in the milk and in the commercial yoghurt used as a starter. Just wanted to say thanks for you bit of insight when I tried to make my first batch of yogurt a few weeks ago. It seemed alright but the one jar I tried and varying tastes…some tart, the right consistency, the rest like a thick milk with a sweet taste. I decided to try again, this time for sure using an SCD legal starter with Dannon and an open crockpot—water up to the tops of my jars. That worked wonderfully. The consistency is literally like regular store bought yogurt…the tartness takes getting use to(take about sour faces) but some fruit masks it well. Thanks again! Thanks for the awesome “how I do it on a boat” comment! Safe to say, you are the first I’ve heard of fermenting on a boat. I’m about to make my first batch of SCD yogurt. I’ve read that some people use a probiotic capsule as a starter, such as Culturelle. I’m confused. If you can’t store the probiotic above the temp of 75, because it might kill the bacteria, how does fermentation at 100-110 degrees not kill the bacteria? I called the Culturelle company and they were no help at all. I really want to know if I can use my Culturelle as a starter and if so, how many capsules should I use to make 2 quarts? I’m not familiar with Culturelle so I researched it on the BTVC_SCD group on Yahoo and found that you want to avoid it as it contains cultures that are not SCD legal. You need to be a member of the group to search, post, and read it, but here is a link to what I’m referring to: http://health.groups.yahoo.com/group/BTVC-SCD/message/107800 . I know the temperature requirement seems contradictory, but here is the scoop. The heat and time specified by the BTVC is optimized to generate the most activity and consume all of the lactose in the milk. After that time the culture will eventually be killed off at that heat so it’s not so much the temperature as how long the yoghurt is held at that temperature. I cannot make this yogurt. I have no idea what I’m doing wrong. This is my second batch and I’m reading to trash it and give up. Years ago I make regular non-SCD yogurt in the maker and it turned out fine, just following the normal instructions. This time around, I first tried goat’s milk – it was still pure liquid after 24 hours-I had to dump it (I read that I probably used the wrong starter). The second time, I used non-homogenized milk, which created almost a cottage cheese when I heated it. I just went to check the temp on the yogurt after 4 hours (using the dimmer) and it was too low. So I pushed the temp back up. My concern now is that even after 4 hours, it’s still totally liquid with just the cottage cheese stuff. There is no beginning stages of anything that looks like yogurt. Now I thinking I dump it and start over with regular milk or just give up. Do you think you might know what it is that I’m doing wrong? Hmmm. I don’t know what you’re doing wrong. I’ve never tried goat yoghurt so I’m no help there, but you do raise an good question – when does the milk solidify? It’s been so long since I’ve opened my yogourmet before it was done, but I think it happens faster than I thought it would. The “cottage cheese” stuff makes me think that it is congealing as it should though. Until you get your process down pat, I’d check the temp every hour so you can develop the confidence to reproduce it. I am new to this thread, but am on the SCD diet with GAPS thrown in for good measure. I found your blog about the SCD yogurt interesting. I, too, use the Yogourmet and have never checked the temperature. I make raw goats milk yogurt and cows milk sour cream. They both come out great. Here’s the rub. No matter what electrical device you use to make yogurt the current will not be steady, therefore, making the temperature fluctuate. The yogurt making device will be affected by the device itself, the air temperature and the other appliances being used on the same breaker. The culture and type/freshness of milk used presents its own bend to the situation. There goes the idea of keeping the fermentation factors steady. The second thing is, there has to be enough lactose left in the yogurt after the 24 hour ferment to keep the existing bacteria alive enough to make it to your stomach, doesn’t there? You bring up some good questions. Sure, there are a lot of variables, but it seems to work out. I don’t know how long the cultures live with little or no lactose to consume. I’m assuming they can live for two to three weeks as this is the time frame given in the BTVC for SCD yoghurt.